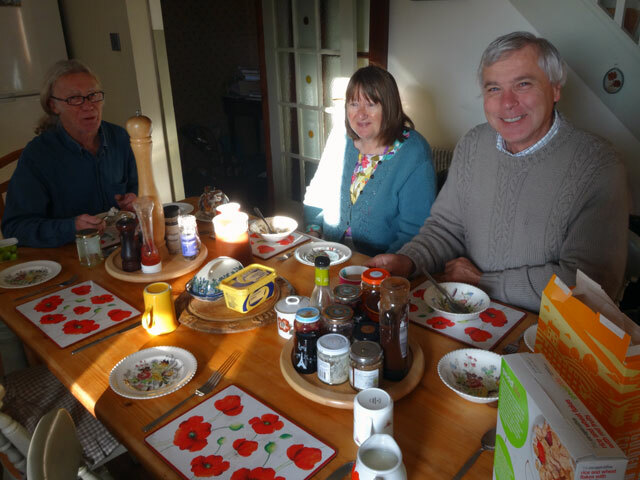 Walked Mix – my body is still aching – and then enjoyed a cooked breakfast in the farmhouse. Tom and Dorothy arrived and we set off for Etal for the Heavy Horse Show at Hay Farm – I travelled with Ewen and Jane, Rachel with Tom and Dorothy, and Olive and Digger coming along under their own steam a little later on. This little area of Etal and Ford seems to be remarkably awake and full of activity. 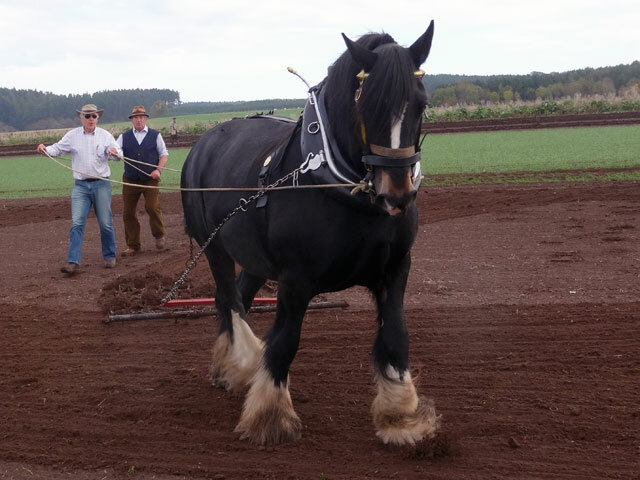 The show consisted of watching heavy horses ploughing and harrowing, of visiting the stables and seeing more Clydesdales, of seeing a blacksmith at work making horse-shoes, of watching numerous old working engines, as well as visiting an exhibition of old equipment which included a penny-farthing bicycle and a nineteen-forties single-decker bus. There was also a super craft show with ladies spinning and all kinds of items on sale and, of course, there was food and drink. From the show Jane and Ewen set off on the next stage of their journey while Tom, Rachel and I went off to visit Ford where we saw a fascinating Estate Village created by Louisa Waterford in the middle of the nineteenth century. 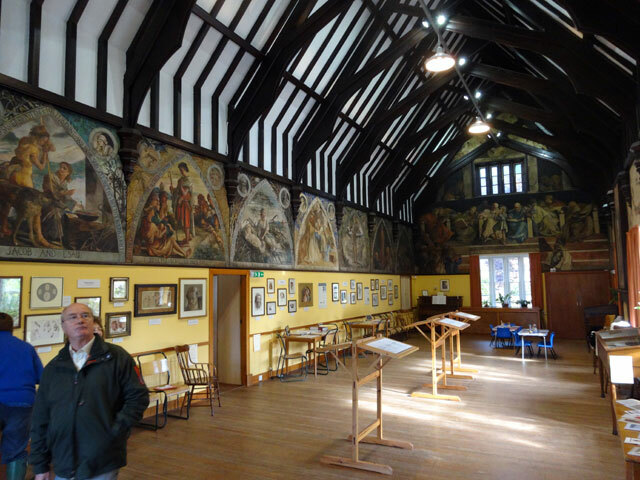 We visited Lady Waterford Hall, built as the local school, where Louisa had painted the hall with pictures telling the Old Testament Bible story and illustrating the heroes of the New Testament. It was most impressive and included a ten minute video presentation on Lady Waterford’s life. I want to learn more about Louisa Waterford. She was tragically widowed when her husband was killed in a riding accident but that accident led to her spending her time at Ford and throwing herself into improving the lot of the people on her large estate. It must have been a huge tragedy for her but led to so much good for her people. Things often work out in strange ways, and good often grows out of misfortune. I also want to explore this area (just half an hour away from Mount Pleasant). 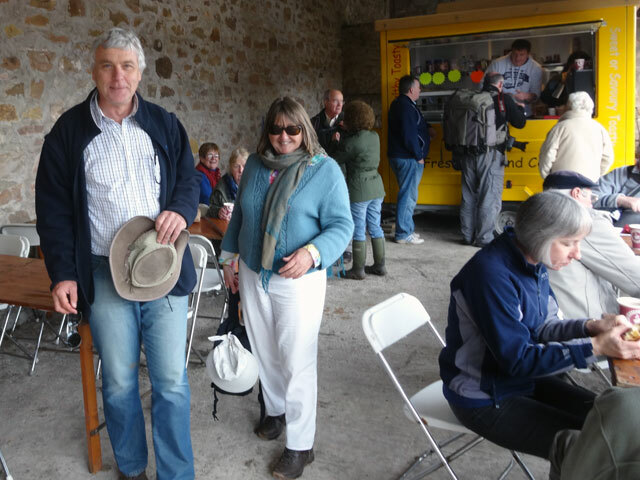 There is a small steam railway, a working corn mill and lots of horse activities. I’ll report back once I have done some more research. Back home I prepared the outline of a service for Sunday week when I am to look after Sunday worship here – I am actually on call for our minister already while she is away on holiday for three weeks but tomorrow the service will be conducted by the worship group of the congregation. I am looking forward to it very much indeed. David arrived to help Olive and Digger sort out their telephone problems (their phone has been virtually unusable for several weeks due to a buzzing on the line and a very strange ringing). Mix and I retired to the summer house to continue sorting out some of the backlog which I have built up (and to rest my weary bones – I was reassured to discover that Tom is suffering as badly as I am)! We dined in the farmhouse and then spent a very relaxing evening in front of the stove in the Granary. We watched a fairly new 'New Tricks' followed by the News, after which we walked the dogs before bed.